Sina, similar to Dexio, has multiple types in her party with Ice Type Pokemon being the majority of her team. She has three Ice types but cannot repeat any of her Pokemon twice in one battle. When the player goes through the Super Single battles, they can encounter Sina randomly every 10 battles like Dexio. Pokemon Trainer Sina’s party is composed mostly of Ice Types. Ice Types are commonly weak against Fighting and Fire but Sina also has a Mandibuzz waiting to swoop in. Bring a Fire Type Pokemon or any Pokemon capable of Fire attacks such as Flamethrower to whittle down her Lilligant, Sandslash (Alola), Abomasnow, and Glaceon. Sina will most likely bring one of her dual type Pokemon, a Fighting type, and maybe Drampa for steamrolling. 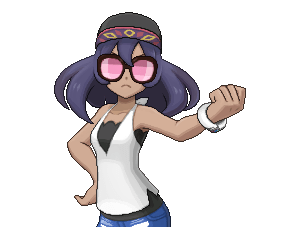 However, bringing a Fighting Type may also help against her Ice Type Pokemon. But some Pokemon such as Mandibuzz may be able to deal heavy damage unless the Pokemon in question is Lucario.